Sony PS3 to Battle Wii With VR/3D Game Controller? Sony's getting desperate to goose the street cred of its slow-selling PS3, digging deep into its idea basket to catch up to the popularity of the Nintendo Wii. Apparently the company's plan of attack is to develop a VR/3-D controller, illustrated in this patent application for a "handheld computer interactive device" spotted today. 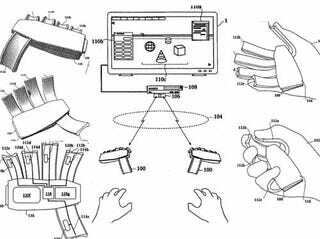 It takes the abilities of the Wii controller a step further, where in addition to determining where your hand is in 3D space, sensors in the glove can be triggered by individual fingers, letting you grasp objects or assign each finger to a different function. Added to that is tactile feedback. Hmm. Teledildonics, anyone?